It was a mixed month for world equity markets, with net January changes ranging from +7.4% (Brazil), +0.5% (USA - Dow, Germany), -0.6% (UK), to -2.3% (France). A retrace of 5% in the early spring is due, but that won't be enough to dent the broader upward trend, with most indexes set for 15/20% upside from current levels. 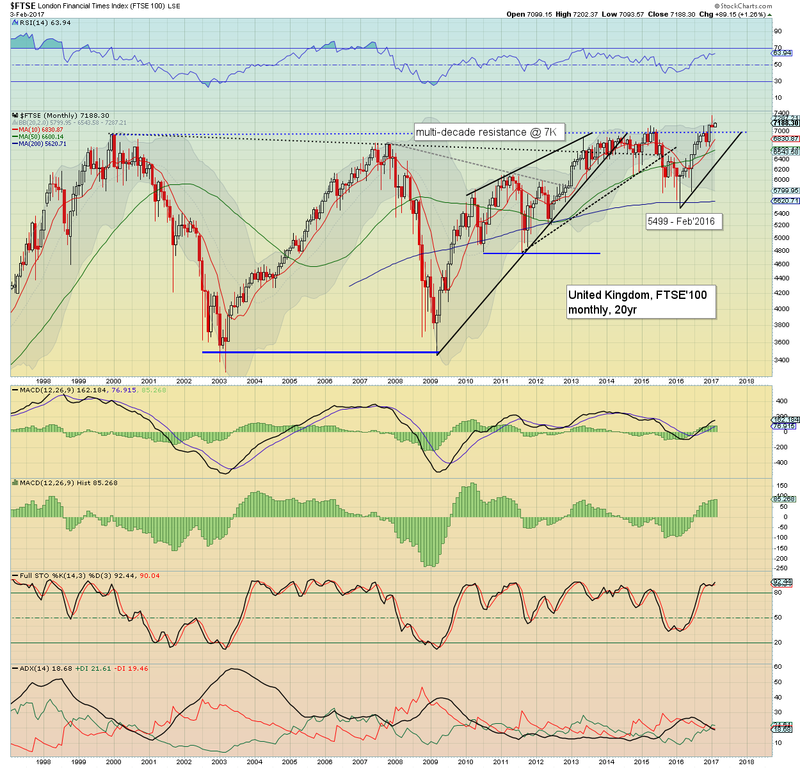 US equities climbed for a third consecutive month, with the Dow +101pts (0.5%), settling at 19864. However, there was a very notable break (if temporary) above the giant psy' level of 20k, with a new historic high of 20125. 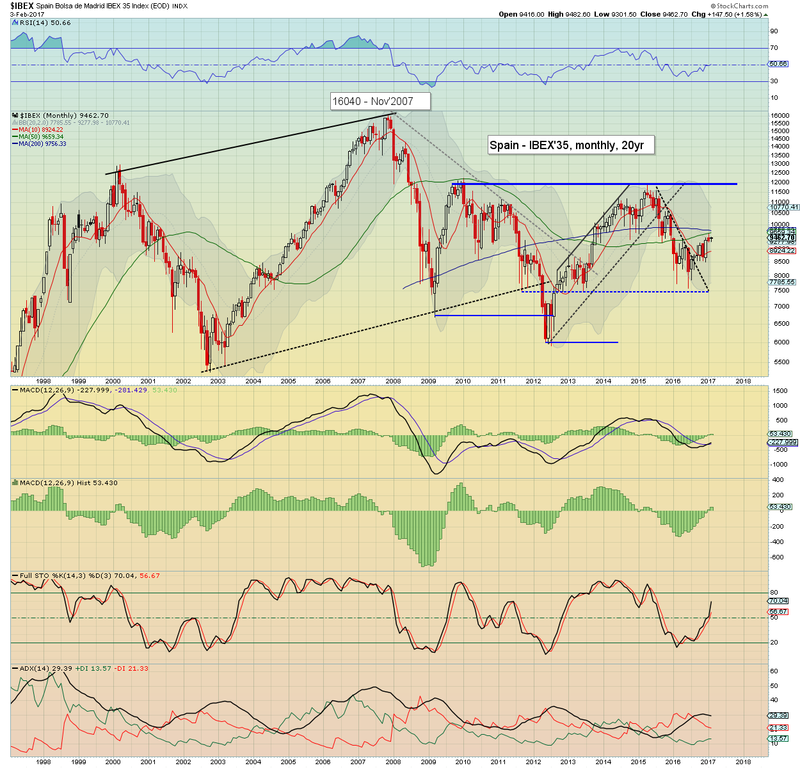 The upper bollinger is in the low 20000s, with the key 10MA in the 18700s - which is some 6% lower. Underlying MACD (green bar histogram) is on the slightly high side. Even if the market is at/close to a mid/long term peak, a bearish cross is out of range for at least 3-4 months. Best guess: near term upside of another 1-2% to perhaps 20300/500, before a basic retrace of around 5% - certainly no lower than 19k. Broadly, another 15/20% higher by year end is a realistic target. Equity bears have nothing to tout unless a monthly close back under soft support of 19k, where the key 10MA will soon be lurking. 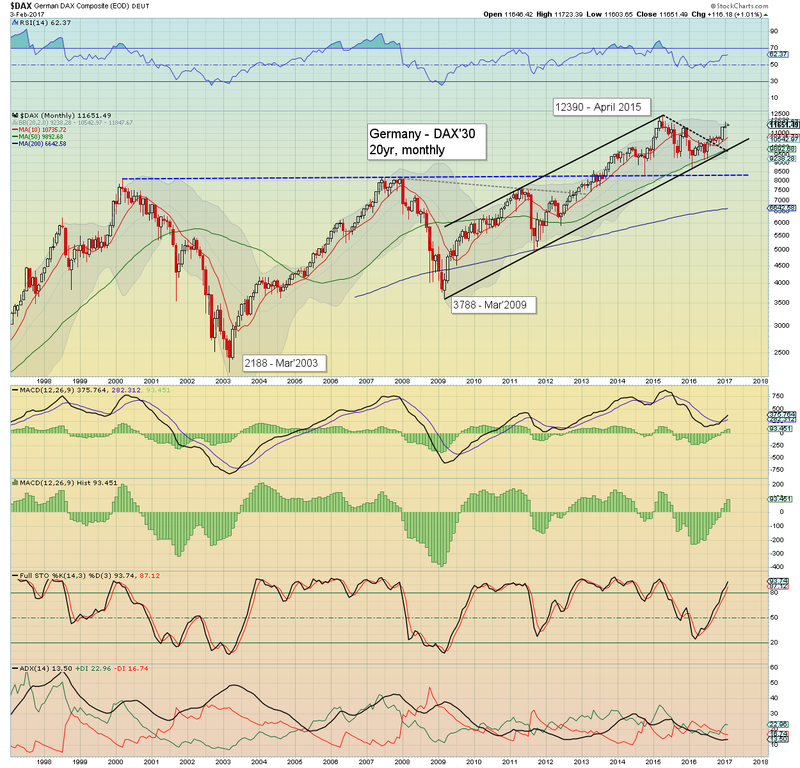 Like the Dow, the DAX managed a net monthly gain of 54pts (0.5%), settling at 11535. 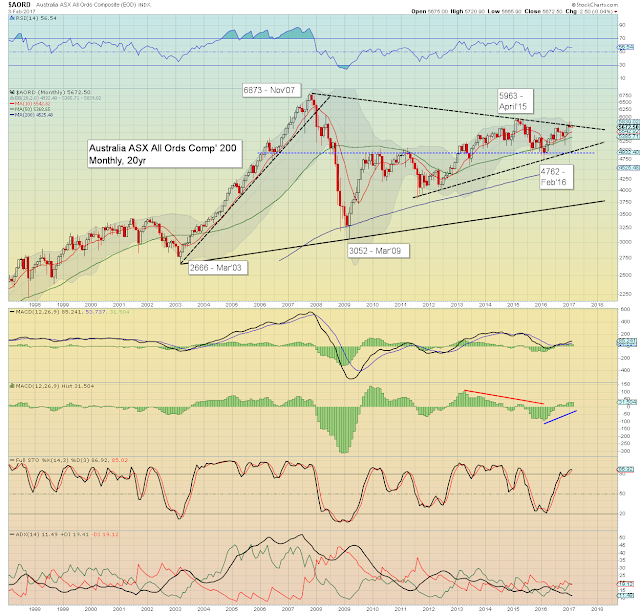 The January candle is a little spiky on the upper side, as there is plenty of resistance within the 11600-12000 zone. 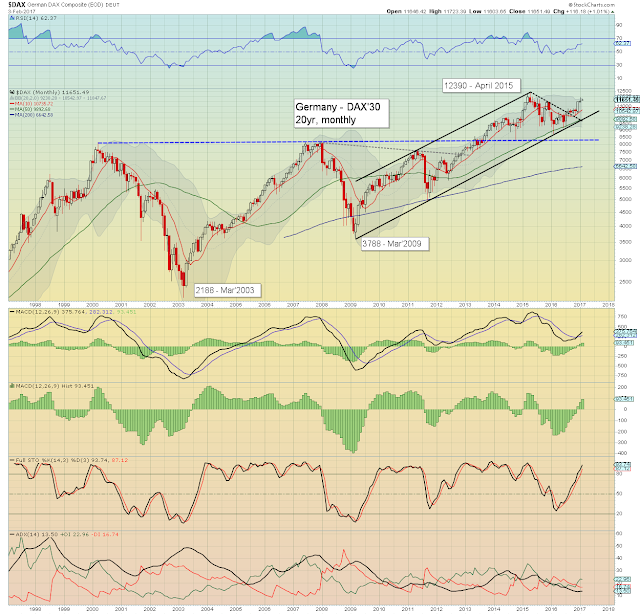 For the wave counters out there, the DAX has the cleanest price structure of all indexes. We are arguably in a final fifth wave higher, of the rally that began in spring 2009. A basic upside target from current levels, would be to at least marginally break above the April 2015 high of 12390. 8K is now powerful support, and if you like the notion that the next bear market will be on the order of 40/50%, the DAX needs to first climb to around 15/16k. That is likely to take until at least spring 2018. The BoJ fuelled Nikkei is struggling a little, with a net Jan' decline of -73pts (0.4%). There is some discernible resistance around 19500/600. 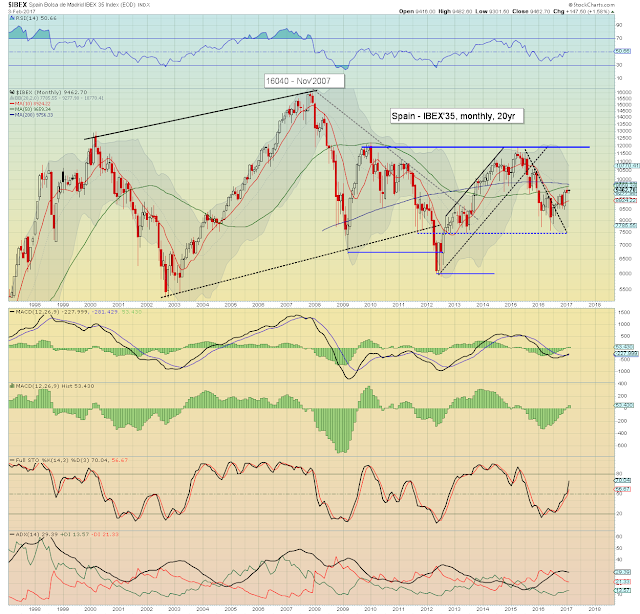 Much like the DAX, there is a somewhat clear wave structure of five big waves from the 2009 low. 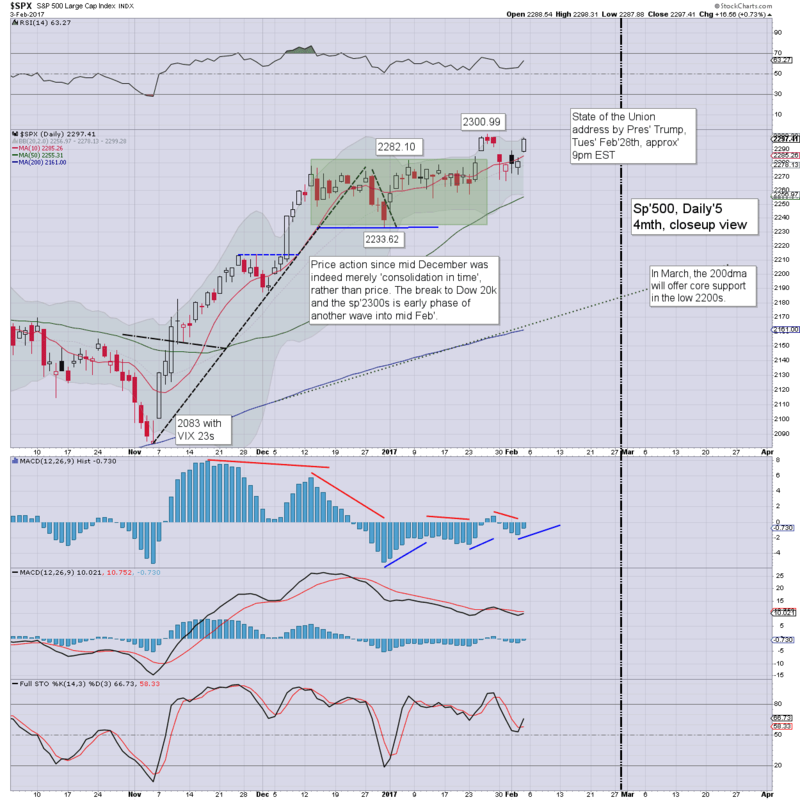 Equity bulls should still be looking for another push above the 2015 high of 20952. The Shanghai comp' saw a net gain of 55pts (1.8%), settling at 3159. Price structure has been consistent slow upward grind since Jan'2016. Things turn very bullish with any price action in the 3700s, or bearish, with a break of the 10MA.. around the 3k threshold. 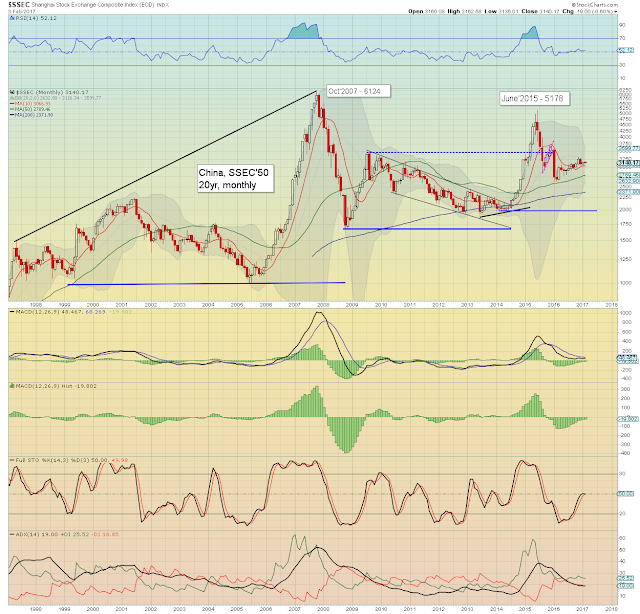 The Bovespa began the year on a powerfully bullish note, +4443pts (7.4%) at 64670. Further upside to the May 2008 high of 73920 looks a given. 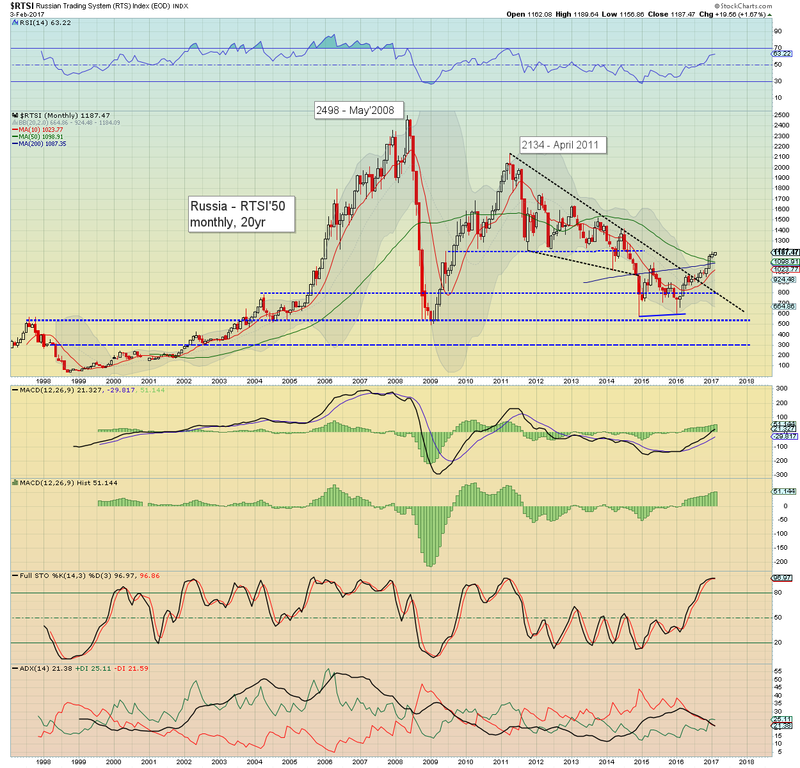 As ever, the Brazilian market/economy will be particularly swayed by price action in commodities. The Russian market had another positive month, +15pts (1.3%) at 1167, having come close to first soft target of the 1200s. 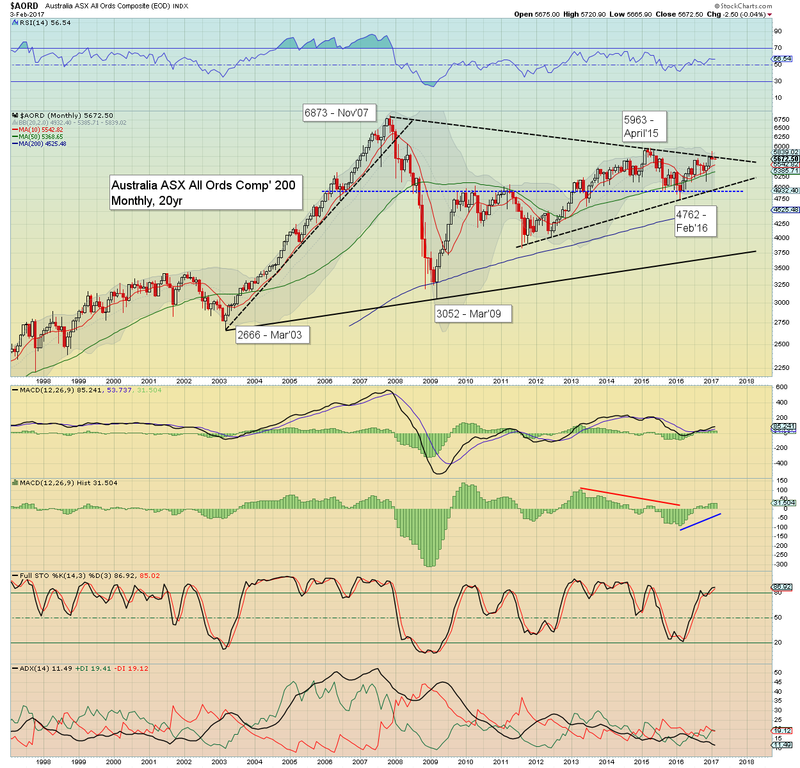 Any monthly close >1200, will offer grander upside to around the 1700s by year end. 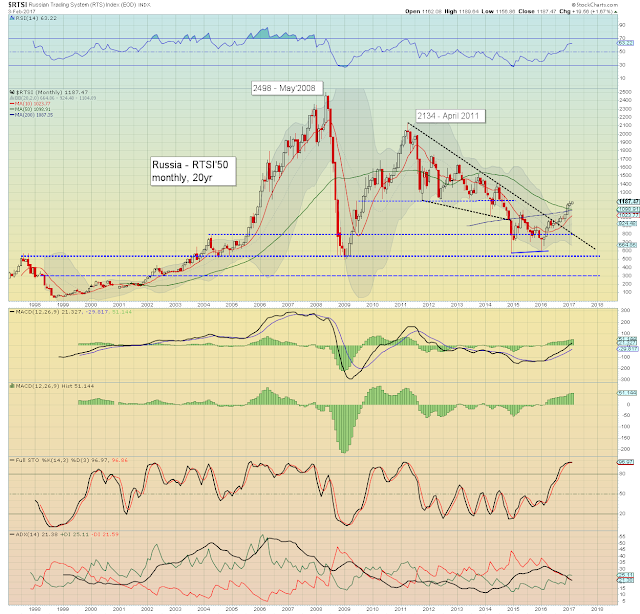 The latter looks probable if oil prices can climb into the $70s. It was a mixed month for UK equities, having broken a new historic high of 7354, but settling -43pts (0.6%) at 7099. The Jan' candle was indeed rather spiky, as there is strong resistance in the low 7000s. However, it is important to keep in mind that this was a second consecutive monthly close above multi-decade resistance of 7k. Indeed, the 7k threshold which used to be resistance, is now first support. 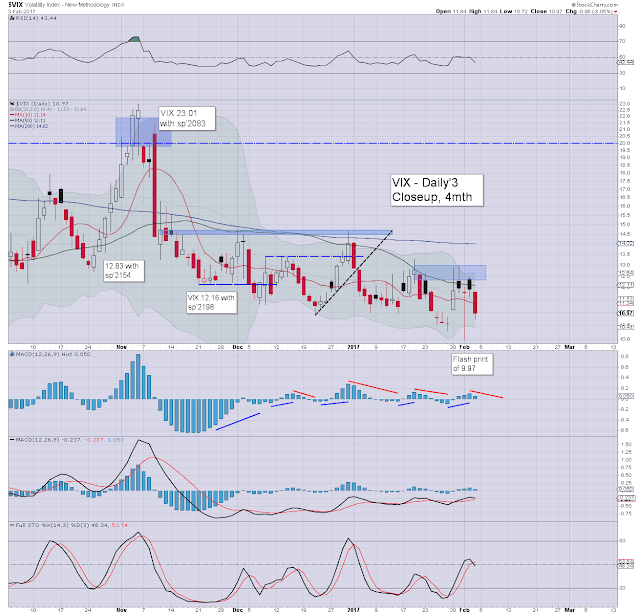 The CAC struggled, with a net monthly decline of -113pts (2.3%) to 4748. However, this only negated a portion of the powerful Dec' gains. 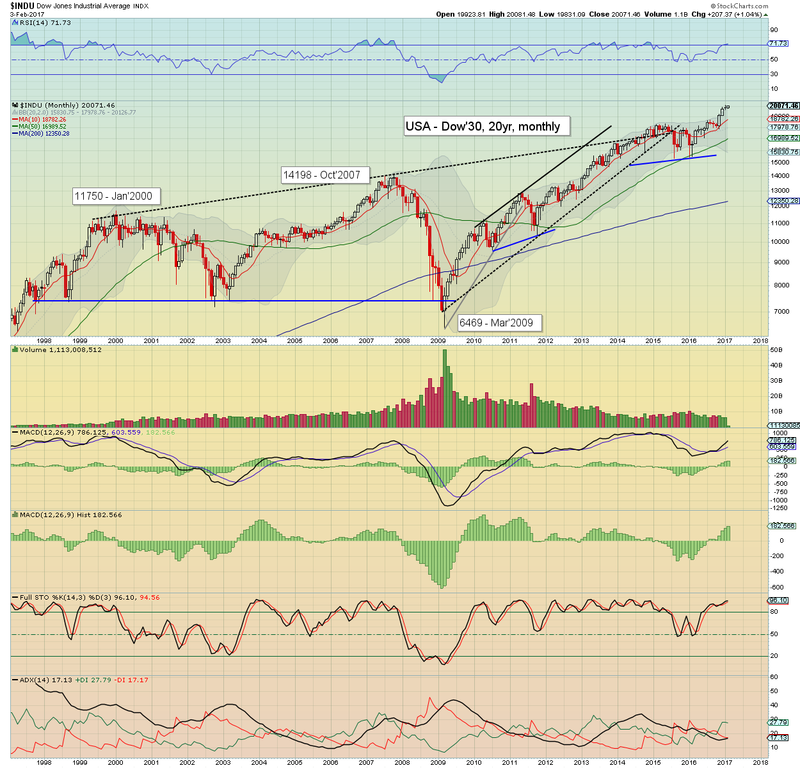 Things turn exceptionally bullish with a monthly close in the 5100s. That looks difficult in the near term, but certainly seems viable by May/June. Any such monthly close would then offer grander upside to the 6000s by year end... and that is a clear 20% higher. Special note: Remember how I called a Trump victory? Well, I'm also calling for Marine La Pen to become President of France. That would arguably shock the geo-political world even more than BREXIT and Trump combined. 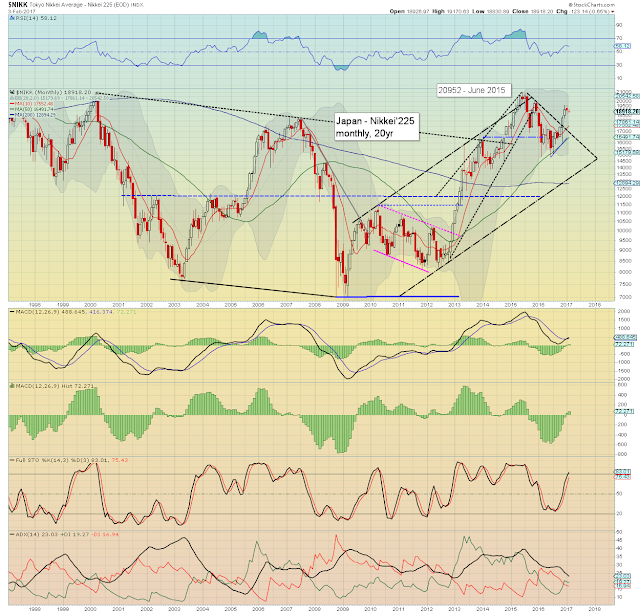 The Spanish IBEX cooled a little, with a January net decline of -36pts (0.4%) to 9315. 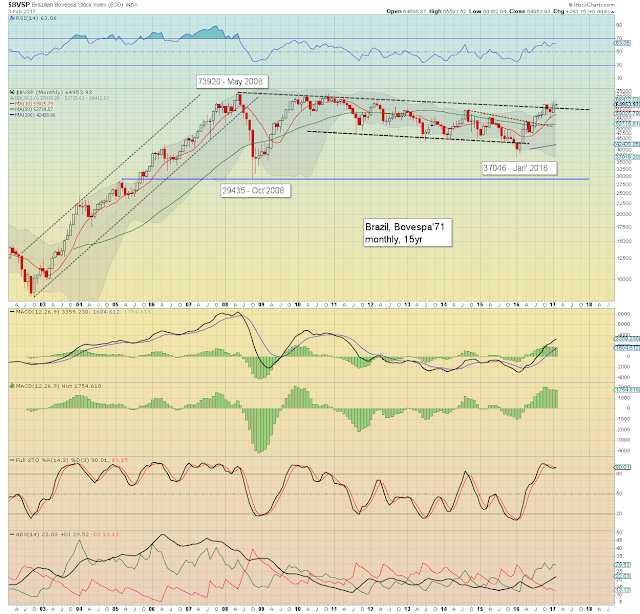 The mid term trend remains bullish, with first big target.. the huge resistance threshold of 12k - some 27% higher. 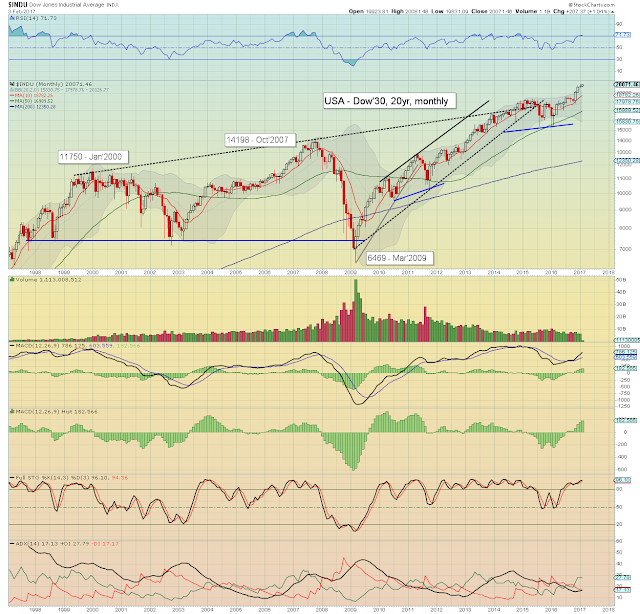 Any monthly closes >12k would offer further upside to 15/16k. 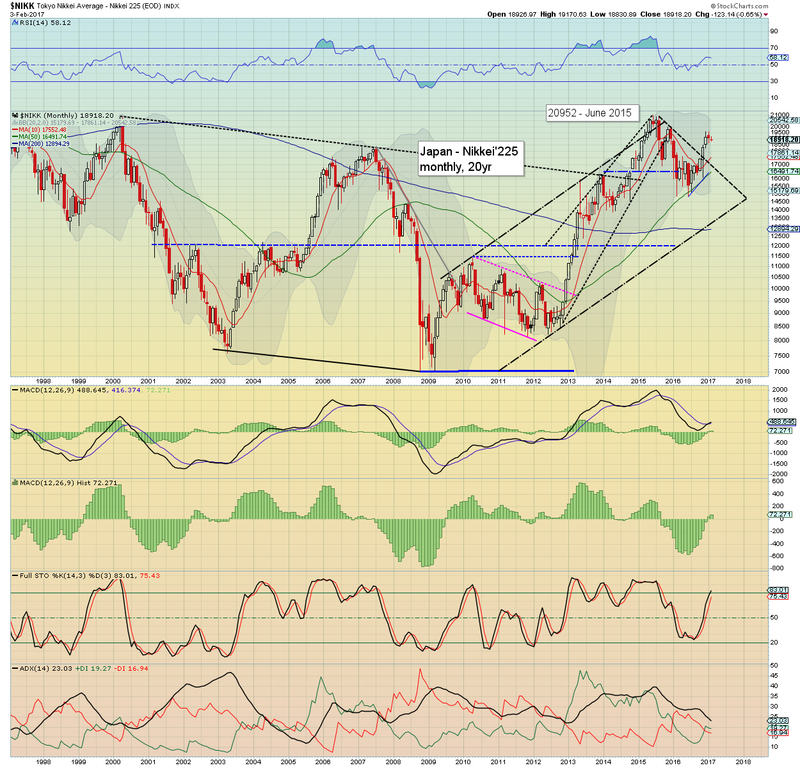 If the latter occurs, it would have massively bullish implications for most other world markets. The Aus' market pushed to 5876, but was unable to hold the gains, fully reversing, with a net monthly decline of -44pts (0.8%), settling at 5675... back under (broken) trend/resistance. Despite the cooling, the initial break is important, and renewed upside looks due, not least if commodity prices push broadly higher this year. January was a rather mixed month, with 5 markets net higher, and 5 net lower. The USA continues to lead the way higher, followed by Germany, the UK, and Brazil. Most markets have a clear 5% of downside buffer before their key 10MAs would be tested. Equity bears have nothing to tout unless most markets are back below their respective Nov'2016 lows, which for the Dow is 17883, a very considerable 2187pts (11%) to the downside. *fed officials: Harker on Monday, Bullard and Evans are due on Thurs', with Fischer early Friday. I am fast approaching the fifth year for this little corner of the blogosphere. If you value my posts, you can support me via a monthly subscription. For $20pcm, you will have access to my continued intraday posts, which number 220-240 a month. 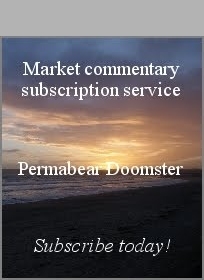 At permabeardoomster.com, I focus on the indexes and VIX, but also try to cover individual stocks each hour, along with commodities, and other miscell' things. Or you could save up the money and buy one share of AMZN in 2019/20. US equity indexes ended the week on a broadly positive note, sp +16pts @ 2297. The two leaders - Trans/R2K, both settled higher by 1.5%. VIX settled -8.0% @ 10.97. 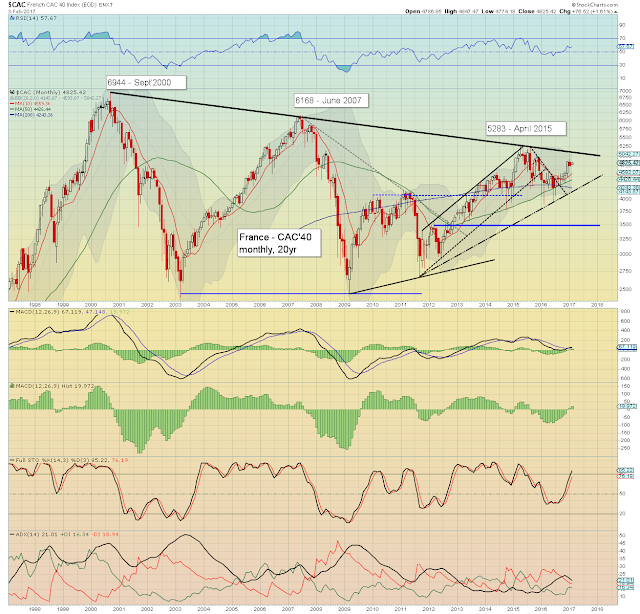 Near term outlook offers the sp'2310/20s, the 30s on a stretch, by week commencing Feb'13th. US equities ended the week on a broadly positive note. Partly, it was due to what was arguably 'goldilocks' jobs data. However, it was unquestionably the case that mainstream clown finance TV coverage of the latest Trump meeting with another group of corp' CEOs inspired equities upward. Such coverage has taken the place of Fed' officials touting 'low rates' or 'possible new QE'. 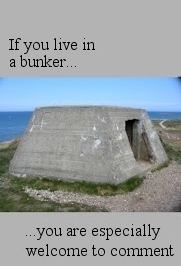 Its progress.. you could say. 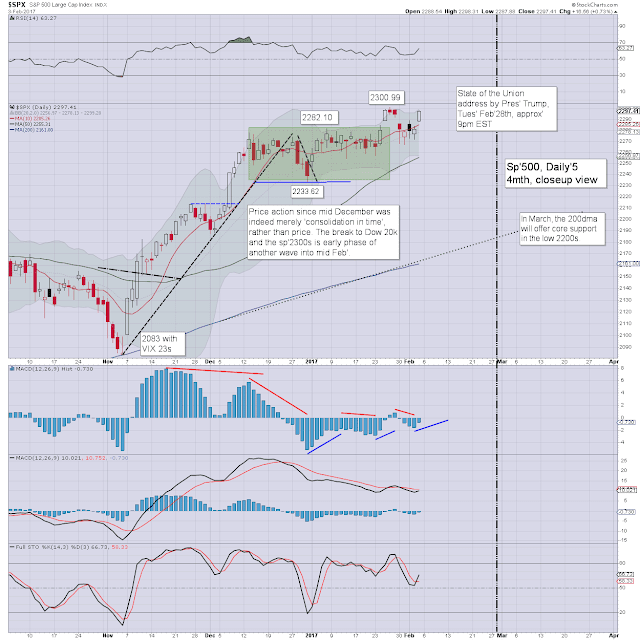 *the weekend post will appear Sat' 12pm EST, and will detail the World monthly indexes. It remains my most important post each month.